August 8, 2016 (The New Atlas) - The current ongoing offensive in southwest Aleppo is admittedly being headed by designated terrorist organisation and Al Qaeda affiliate Jabhat Al Nusra under which a milieu of militant groups are fighting. Just before the offensive was launched, and apparently specifically for the occasion, Nusra would announce that it was severing ties with Al Qaeda (with Al Qaeda's blessing) so as to unite all the armed factions fighting in Syria under one banner. Director of National Intelligence James R. Clapper Jr. described the split from al-Qaeda as “a PR move.” Al-Nusra “would like to create the image of being more moderate,” Clapper said in an appearance at a security conference in Aspen, Colo. “I think they are concerned at being singled out as a target,” particularly by Russian strikes, he said. Then clearly, regardless of whatever name Al Nusra is now attempting to call itself, it is still a terrorist organisation, making it illegal to provide it with any form of material support, let alone fight alongside it on the battlefield. Anyone doing so thus makes themselves a legitimate target of anti-terror operations including full-scale combat. It also makes anyone still aiding and abetting subsidiaries of this newly-unified terrorist front a state-sponsor of terror. 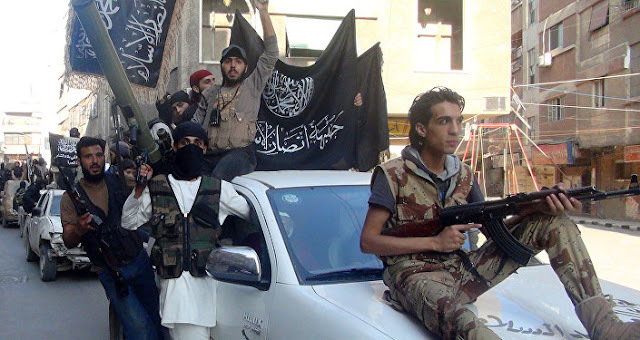 Thus, when Syria's various armed factions, referred to by the US and its allies who provide them weapons, cash, training and sanctuary as "moderates," organised themselves under Nusra's banner, they immediately became Al Qaeda affiliates themselves. What the ongoing Nusra-led assault on Aleppo then represents is the West's final capitulation in betraying its own narrative regarding "moderate rebels" they are arming and backing amid the ongoing Syrian conflict. Beyond the very nature of the admittedly terroristic elements assaulting Aleppo, the notion that this assault is an attempt to "liberate" the city is equally problematic to those attempting to promote it. 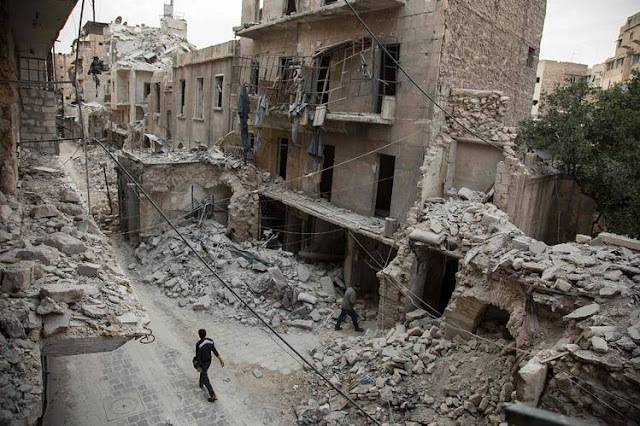 Aleppo, the largest city in Syria before the war broke out in 2011, had been spared the worst of the fighting until in 2012 large groups of militants began crossing the border between Turkey and Syria and quite literally invaded the city. Amid the see-sawing battles over the next four years, sections of the city would change hands between government defenders and militant invaders. That was until several weeks ago the Syrian military encircled militants who had deeply entrenched themselves within the city and began preparing for operations to finally clear their presence from the city. The current offensive then, represents a replay of the initial invasion that plunged the city into the current state of war, death, human misery and destruction it now suffers under in the first place. While the Western media attempts to portray militant-held sections of the city as being "liberated," the current breakthrough in southwest Aleppo has put much larger segments of the city's population living within government-held areas of the city at increased risk of running out of essential supplies and suffering from violence incurred amid the ongoing fighting. What the West is basically reduced to is openly cheering on the forces of Al Qaeda it had been attempting to covertly arm and support throughout the conflict under the misnomer of supporting "moderate rebels" all along. It is also reduced to attempting to portray the re-invasion of Aleppo by a designated terrorist organisation as a "liberation." As Syrian and Russian airpower work over the emerging militant corridor being established in southwest Aleppo, and as Syrian forces reorganise themselves along the peripheries of the breakthrough, the prospect of foiling this offensive by delivering a severe blow to the now highly concentrated militant forces partaking in the operation may lead to a general collapse of the militants' fighting capacity across the rest of Idlib province. But that is only if Turkey has finally begun to cut supply routes across their border with Syria, which is likely an essential ingredient to any genuine restoration of ties between Ankara and Moscow.